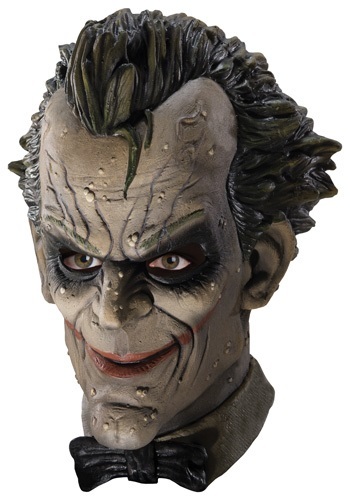 Wear this Arkham City Asylum Joker Latex Mask and strike fear into the hearts of Gotham's citizenry! The mask features the Joker's face as seen in the Arkham City game, with slicked back green hair and wart covered grayish skin. The Joker is displaying his classic wide grin and there are holes in the nose, eyes, and mouth of the mask. How much mayhem can you incite?